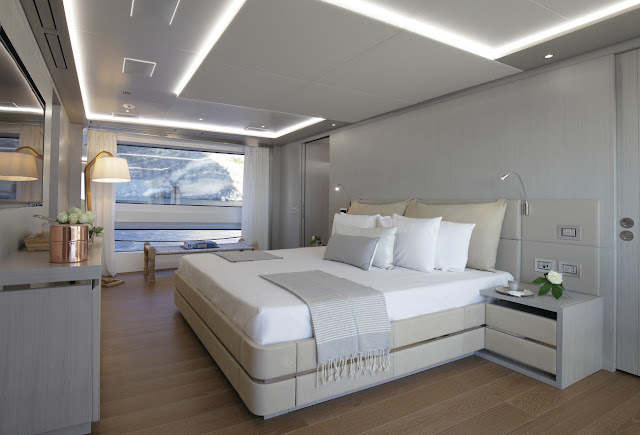 His request was to benefit from a megayacht able to sail on Mediterranean seas or Caribbean with elegance, space and modernity. And that’s how Mediterraneo 116 Oli imposed itself. 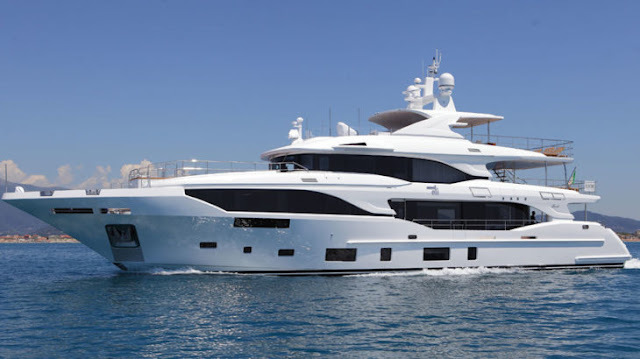 Then Benetti and designer Giorgio Maria Cassetta have worked hard to satisfy the owner’s desires, in order to build the ideal yacht, both spacious and bright with many entertaining possibilities for all his family. 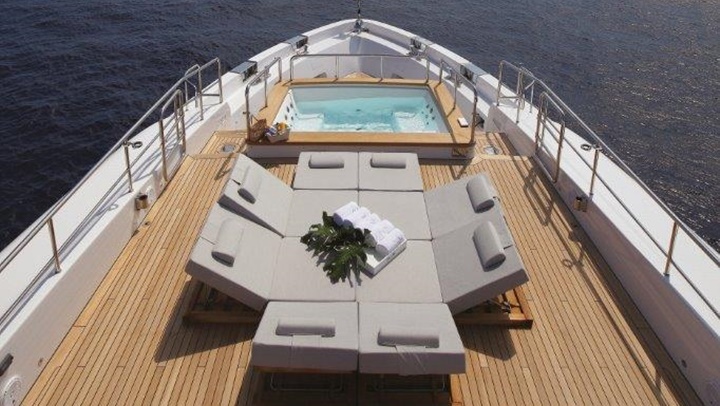 The Mediterraneo 116 Oli yacht seems today to suits all his envies. 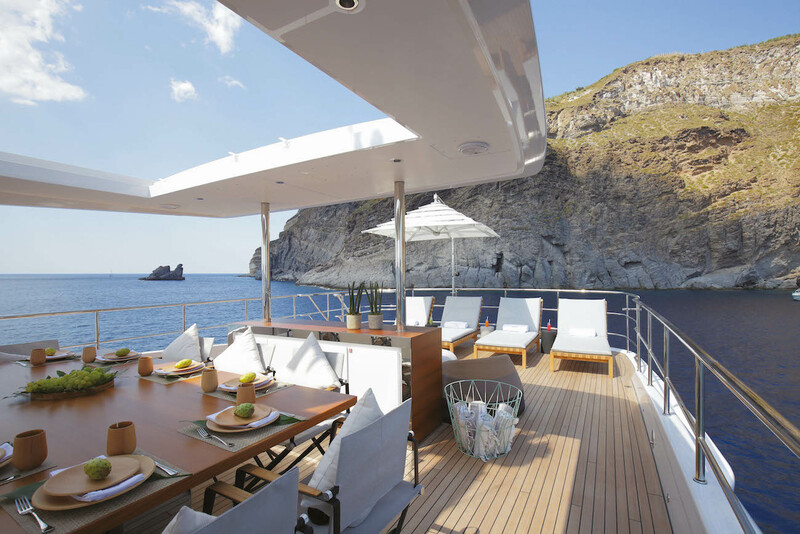 It’s a 35.5m-long yacht, and its surface area offers plenty of entertaining possibility and space to integrate large rooms, vast decks and all necessary high-end technologies to Mediterraneo 116 Oli. 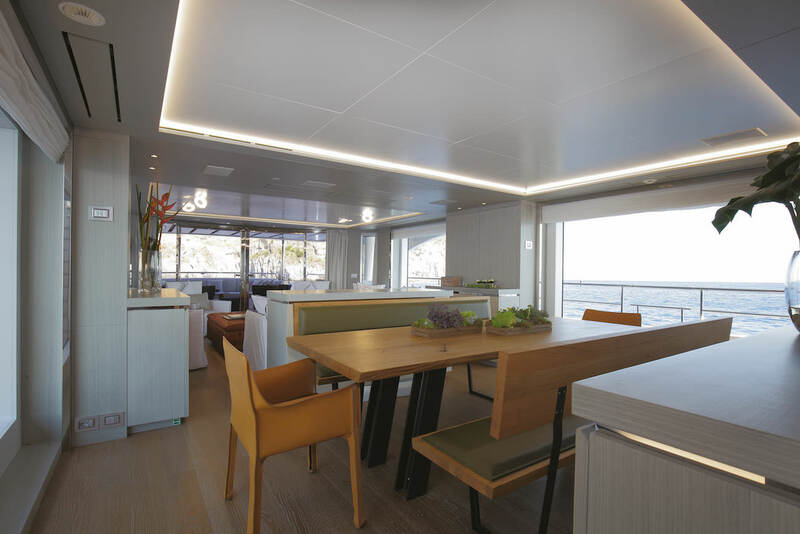 The designer’s first concern was light and how to find a way to flood the yacht with natural light, particularly with impressive 3m-long crystal glass doors. Then all indoor spaces’ design and potential reveal themselves, and the feeling of wellbeing naturally invades us. So Mediterraneo 116 Oli offers all space and functionality you can find on much bigger yachts thanks to its amazing proportions and lines. 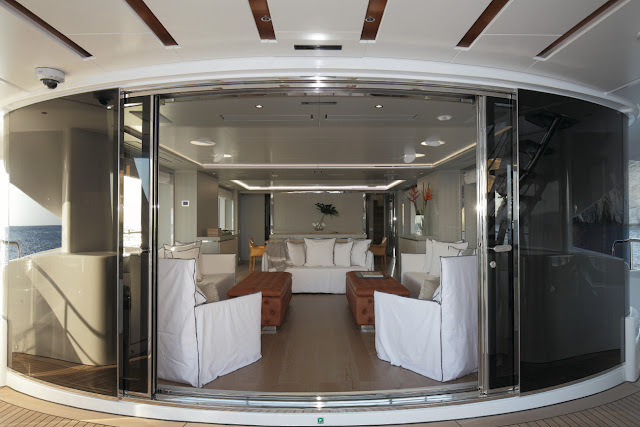 From the lower deck to the sundeck, everything appears to be contemporary, practical and innovating. 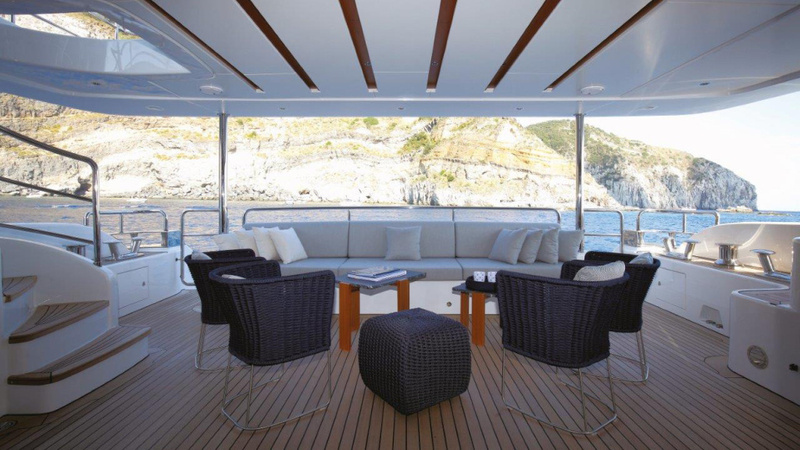 Then Mediterraneo 116 Oli’s main deck offers a breathtaking view of the sea whether it is from the outside or inside. 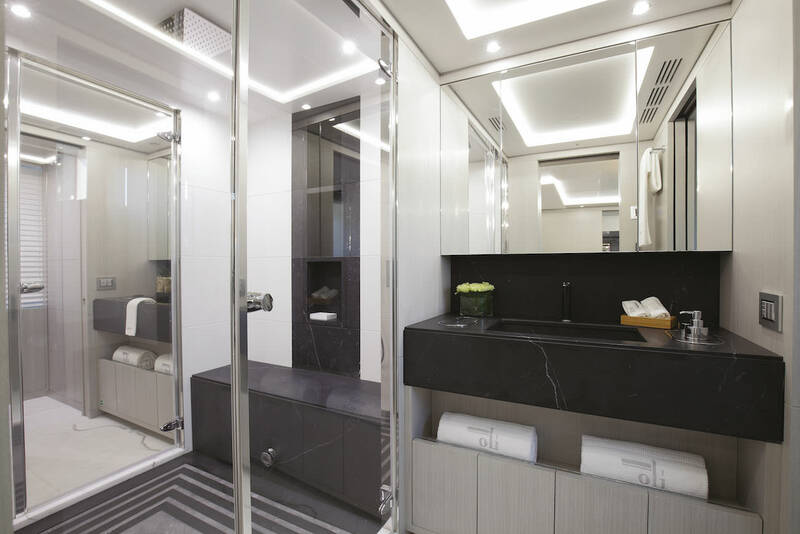 And these two spaces are totally connected thanks to large glass doors that accentuate the luxury yacht’s harmonious design. Concerning the dining space, it can welcome up to 12 guests around a large table surrounded by long walkways that can be perfect to relax, as if you were on your balcony. 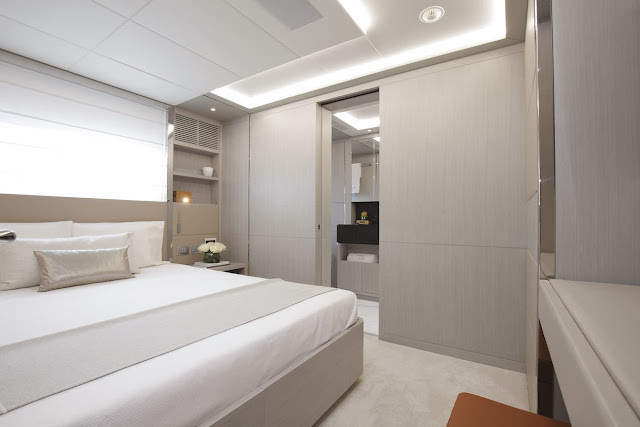 On the same level you can find the owner’s spaces and more precisely a bright studio as well as the main cabin. 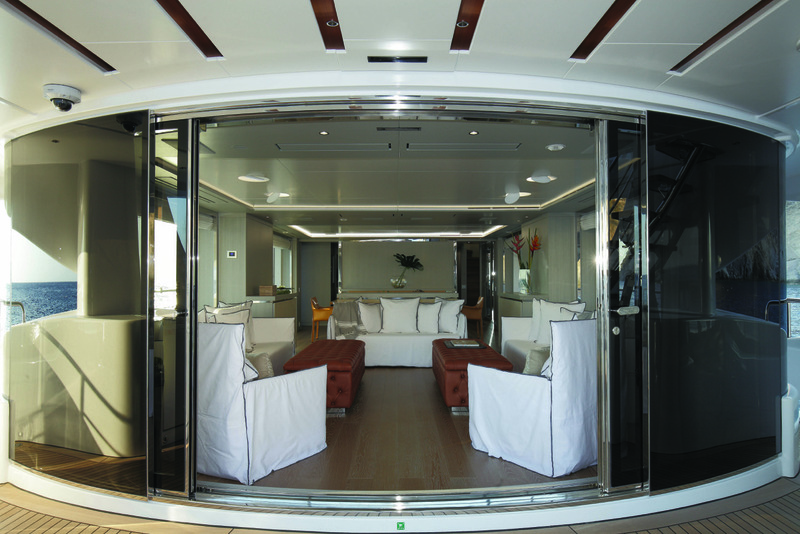 This is a 3.4m-long cabin that occupies a big part of Mediterraneo 116 Oli’s main deck. 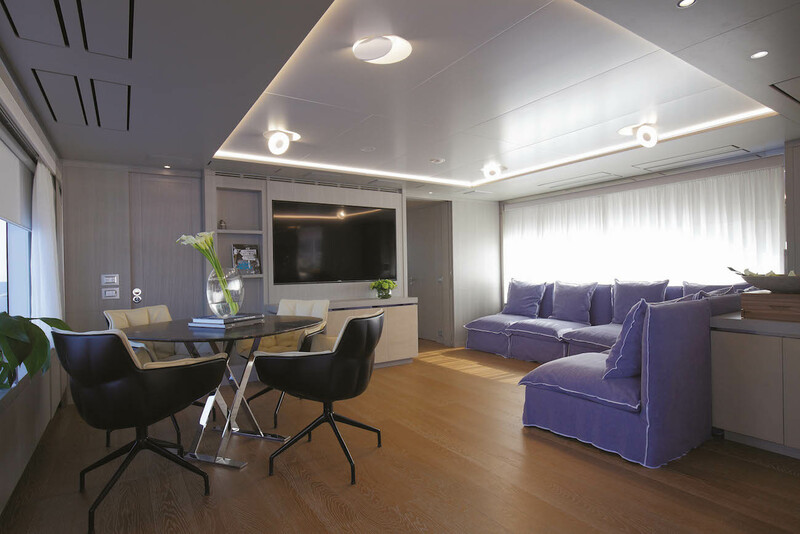 On the lower deck, the common point is always the light and you can find four other double cabins plus two VIP suites and two cabins with bunks and each with its own bathroom of course! Each bathroom appears to be sophisticated and decorated with Sculptural and Dark Black Marble in matte finish. Then, Mediterraneo 116 Oli also keeps a secluded space for the crew that is only accessible by a separated walkway so the passengers are never disturbed. Finally, the upper deck on Mediterraneo 116 Oli offers a spacious outdoor space and plenty of entertaining possibilities with for example a swimming pool to admire the 360° view of the sea. As for the sundeck is represents 80sq.m and 16m long to relax and enjoy the fresh marine air. 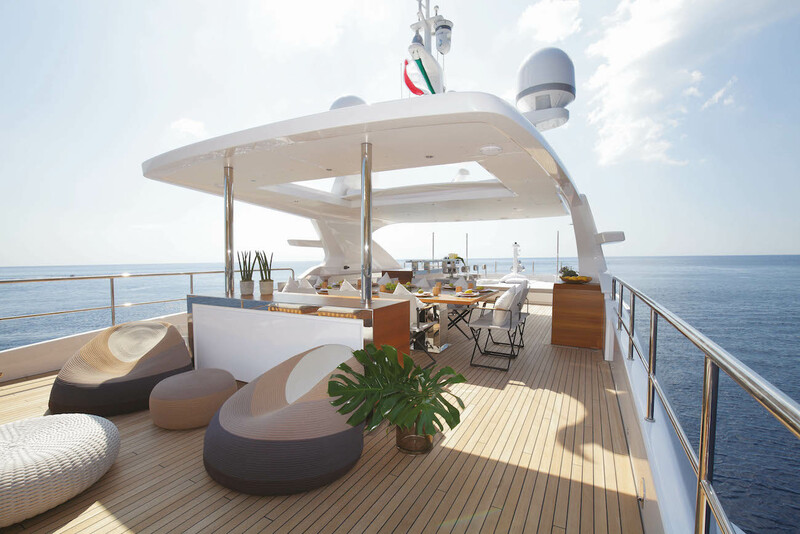 As the owner wished, Mediterraneo 116 Oli yacht appears to be sophisticated and corresponds to his own needs and tastes, designed in accordance with Benetti and the designer. Only one wood was used with stainless steel inserts that cleverly decorate the rooms until the last detail. The furniture remains minimalist and only serve well-being. 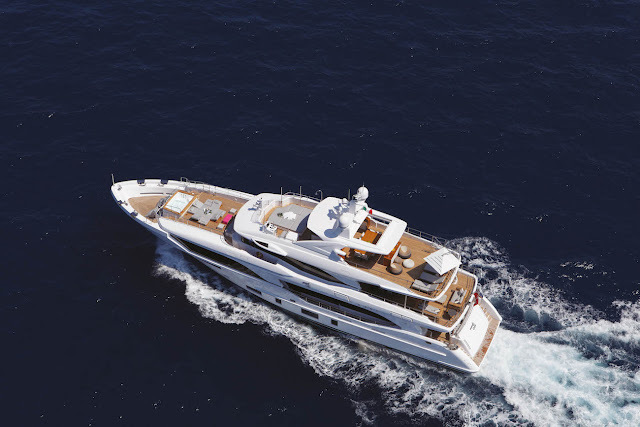 As an end, the yacht’s motorisation can achieve a top speed of 15 knots and a cruise speed of 14 knots without ever disturb the passenger’s tranquillity thanks to an anchor stabilizer. We only have to guess how much the actual owner has had to spend to benefit from such luxury!